The flag represents “the Republic for which it stands.” That Republic is the foundation for maintaining our Union of States. The purpose for creating and maintaining the Union of States is to “secure the Blessings of Liberty, to ourselves and our Posterity.” The first principles of that Liberty are codified in the First Amendment of the Bill of Rights. How is it that so many people are more attached to the flag than those inalienable, God given Rights that we are supposed to be defending? How can we make it illegal to burn a flag, and sit back, day after day, as our own representatives tear through our Liberty like a whale through a net? I know from public polls and personal experience that less than 2% of Americans can name all five Liberties in the First Amendment, from memory, without looking for the answer. How can some Americans become more attached to a flag than the Liberty that America was created to protect? Perhaps it is because Americans, as a whole, have become so ignorant of their Rights that many will desperately cling to symbols instead of standing for our Liberty. It is not a flag we fight for. It is not a flag that makes America great. It is the protection of Liberty that recognizes our Right to burn that flag that makes us different from everyone else. See what happens if you burn a flag in China, Iraq, or North Korea. Is that really the model we are striving toward? Sure it’s offensive. Sure it’s disrespectful. But you have no right to not be offended and you have no right to be respected. I have a Right to offend and disrespect. Without that Right, you are a slave. Not too long ago many were shouting that mantra at the liberals and the LGBT, declaring it “unAmerican” to censor people they deemed “offensive.” How quickly the terms of Liberty are forgotten and how fickle people become when they are now offended. “Without Freedom of Thought, there can be no such Thing as Wisdom; and no such Thing as publick Liberty, without Freedom of Speech; which is the Right of every Man, as far as by it, he does not hurt or controul the Right of another: And this is the only Check it ought to suffer, and the only Bounds it ought to know. There is another issue of property. If you own the flag it is your property to burn. The federal government made the burning of money illegal, because they say that the paper money is federal property. Are we saying that every flag we buy is still owned by the government so they can prosecute us for burning their property? What if I take a bed sheet and draw a US Flag on it and burn it, will I go to jail or have my citizenship revoked for that, too? Who defines this offense? Who punishes this offense? It will be those in government who have proven themselves ignorant and irresponsible to Liberty; those in government who wrap themselves in that flag and then torch our Bill of Rights. That is a power we ought not allow government to exercise, it is one they have proven they do not deserve to wield. Those in government who are ignorant of Liberty and those in government disposed to usurp are not going to overturn the Right to Free Speech by amending the Constitution, but what they will do is create laws attacking specific aspects of Free Speech or engage in efforts of societal censorship (political correctness) and make us censor ourselves. Self censorship is the greatest form of servitude because the slaves never see the chains that bind them. We must KNOW that speech cannot be censored by government, and the people should not be afraid to speak! The founders of our Constitutional Republic burned their flag, they burned effigies of their politicians and tax collectors, too. They burned their flag as an expression of sadness over their Liberty lost through government usurpation. They burned their flag as an expression of disgust over the despotic attack by their government upon their Liberties. Their flag meant no less to them than our flag means to many Americans. They loved their country of Great Britain. They continually prayed for reconciliation with their country, up to and even beyond the Declaration of Independence. To them, burning their flag, was the most powerful way to express the utter despair they felt over their government’s refusal to recognize the Rights of all Englishman as guaranteed by their Constitution and by God. To them, burning effigies of their tax collectors and politicians, was the most peaceful way to show their complete disgust for the negligence and criminality of those they had entrusted as guardians of their Rights. As a matter of fact, the colonists did something “worse” than burning the Union Jack, they created a whole new flag as a statement of their defiance and independence! Therefore, it is not even historically accurate to claim that our founders would not advocate burning the flag in protest. They personally knew that power of that free expression. We must get our priorities in line. We must develop a fonder attachment to Liberty than to paper and cloth. Without that Liberty, the only paper and cloth you will possess are the ones that our government gives you permission to possess and you will only possess it under their terms and conditions. Let us Love Liberty over Security and Comfort, Principles over Parties, and Truth over Personality. I doesn’t matter how you feel about the President. It doesn’t matter how you feel about burning a flag. My Rights are not based upon your feelings. They are inalienable gifts from God. The quickest way to identify a tyrant is find the one who wants to diminish your Rights so people can be happy. The quickest way to find a slave is to locate those agreeing with the tyrant. Perhaps if we had spent more time in school memorizing the Bill of Rights than the Pledge of Allegiance, we would be having a different conversation. 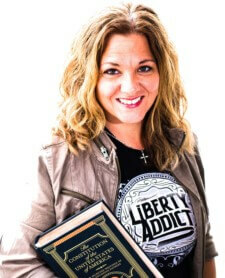 About the Author: KrisAnne Hall is an attorney and also a former prosecutor, fired after teaching the Constitution to TEA Party groups – she would not sacrifice liberty for a paycheck. She is a disabled veteran of the US Army, a Russian linguist, a mother, a pastor’s wife and a patriot. She now travels the country and teaches the Constitution and the history that gave us our founding documents. KrisAnne Hall does not just teach the Constitution, she lays the foundations that show how reliable and relevant our founding documents are today. She presents the “genealogy” of the Constitution – the 700 year history and five foundational documents that are the very roots of American Liberty. If you would like a better understanding of how our Constitution created our federal judiciary, our online educational program called Liberty First University, will give you that understanding free from historical revision and political propaganda. We have both online courses on the judiciary and DVDS available for in home, church, and group meetings. You can find out more by clicking on the image below. The above article (Flag Burning and Free Speech) was contributed to TLB Project by friend/author KrisAnne Hall and was originally published on KrisAnneHall.com.